Research has shown that play and being active outdoors combine to make a substantial contribution to the lives of children and adults alike. Play has been found to reduce stress and aid in development of the brain. Frequent and regular physical activity can increase well-being, longevity and reduce the risk of obesity in everyone (1). Many health care professionals and educators consider play as an important contributor to children’s development. It is a process where children can develop on their own terms through interaction with the physical and social environment. In free play, children’s reading readiness and sociometric status among their peers is readily seen through their play behaviors which can begin to foreshadow future levels of functioning (2). Inclusion in all aspects of society is becoming recognized as the new standard of social integration in the developed world. Over the years, people with physical limitations in general, and children specifically, have lived in a socially restricted minority group (3). The value of play has been demonstrated as a critical part of a child’s life and development but it is important to recognize that playgrounds don’t always lead to positive outcomes for all children. In many environments, children with physical impairments and disabilities have become marginalized, and often their parents become marginalized as well, showing the value of inclusion extends well beyond the individual (4). An important element of play and the play environment is that it becomes a medium for a child’s communication and interaction with peers. Children of all abilities have reported the playground as a place where they can have privacy, especially from adults, and where they can interact with friends (5). As a result, play environments for children and families are critical settings for inclusion because play is such an important facet of a child’s development and family life. High quality inclusive play environments benefit children of all abilities reversing the trend of disenfranchisement toward those with physical impairments. In response to the need for inclusion, the concept of universal design in play goes beyond application of the minimum statutory requirements of ADA (6). The value of play and need for inclusion in play environments has led to sections defining minimum requirements for accessibility in playgrounds in the 2010 ADA Standards for Accessible Design. Briefly, these minimum standards require one-half of the elevated play elements to be on an accessible route of travel. Minimum requirements for the accessible route include transfer platforms that are allowed in smaller playgrounds and accessible loose fill surfacing (7), each of which leave room for improvement. Ramps to play structures are required when there are twenty or more elevated play events for a given age group (2-5 or 5-12 year olds). Ground level play features such as play panels and climbers or slides that can be accessed and exited on the ground surface are also prescribed in quantity and type based on the numbers of elevated play events. Going beyond the minimum standards can be accomplished by furnishing ramps to the majority of play features, and having all elevated play features on an accessible route. Additional ground level events, and highly accessible unitary surfacing on the ground level may also help accomplish this. Accessibility has been thought to have a universal value to everyone in the population, providing a rebuttal to the commonly used and mistaken argument that costs of improvements for higher levels of accessibility are spent only for the few that are physically in need of them. Consider the newly designed door levers originally designed for accessibility that allow people with arms full to open a door with the drop of an elbow. Ramps originally installed for wheelchair access have found application by bicyclists, people pushing children in strollers and those with rolling luggage. These are a few examples of features originally conceived for accessibility which have found universal value in the overall built environment. Another example of the universal value of accessibility to the general population may be found in the realm of play and playgrounds. A recently built accessible playground at Coffee Park in suburban Dallas has been seeing heavy use and is a potential case to test the concept of the universal popularity of accessibility in play environments. The playground is ramp accessible to over half of the elevated play events and either ramp or transfer accessible to all of the elevated events. There is also transfer accessibility provided from the ramped surfaces onto slides to aid children with disabilities. In addition to the complete accessibility of the elevated events, there are twice the numbers of ground level events specified by ADA, when these could have been entirely omitted because of the ramp accessibility exception (7: 240.2.1.2 EXCEPTION). The Director of Parks and Recreation has stated that the playground at Coffee Park, built in 2009 to exceed the standards of ADA, regularly experiences high levels of user traffic. This study was undertaken to test the hypothesis of the universal value of accessible play environments to everyone including those without disabilities. 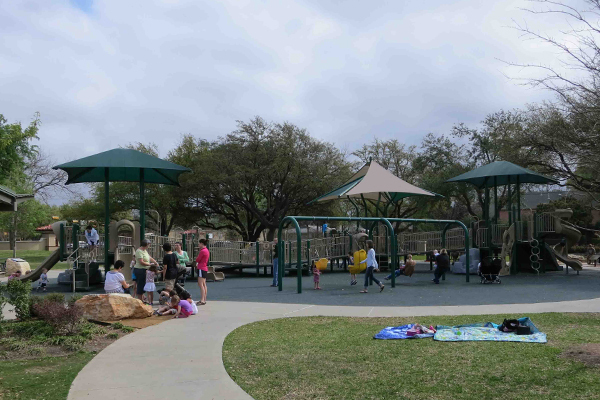 With Coffee Park, the community has eight well developed neighborhood parks, all being less than ten acres in size. Seven of these parks have playgrounds built with the goal of providing recreational play value to children and families. All of the playgrounds meet the standards of ADA at some level. Permission to do user observations was obtained from the Director and was conducted in a single week during March of 2012. Children and total users including adults, teens and children were counted in the play environments of each park and recorded. The weather on all days was overcast and humid with the temperatures being between 68 and 75 degrees Fahrenheit. The setting presents some unique opportunities for a study that will hold a number of variables at similar levels. The relative homogeneity of the population itself offers the value of having a generally uniform population across all of the parks. Typically, the parks are all very well maintained, having large old growth trees, including a variety of attractive amenities and all are physically located within a few miles of each other. Another unique feature is that of the playgrounds themselves. Each of the facilities are well maintained, and meet most current playground safety and ADA standards. They are all built using equipment of the post and platform style and are from the same playground manufacturer. As a result, for an informal study, there are a number of environmental variables that can be considered to be held at reasonably similar levels. To level the comparisons, user counts were equalized among the parks by translating them into ratios of children and of all users per play event. Play events include both elevated and ground level events in the playground. 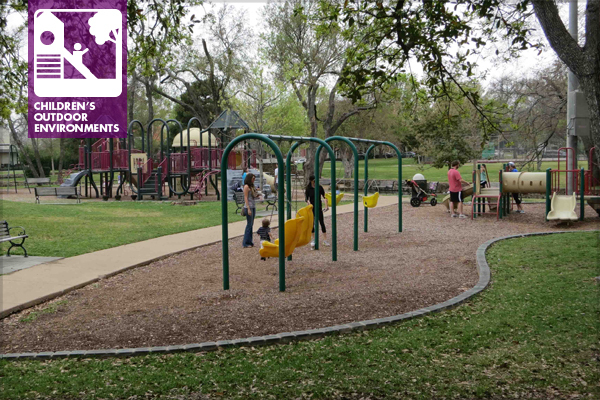 Among the parks, the playgrounds at Curtis Park, Caruth Park, and Coffee Park were the most comparable in terms of size and numbers of play events. In terms of total play events, Curtis Park has 35 play events, Caruth Park has 37 play events and there are 40 play events at Coffee Park. Table 1 shows play events, accessibility and user ratios for each playground in the study. Of the seven playgrounds, five had loose fill engineered wood fiber (EWF) surfacing and two had unitary poured in place (PIP) surfacing. The EWF meets the basic requirements of ADA while the PIP goes beyond the standards for a higher degree of accessibility. The parks with PIP surfacing are Coffee Park and Germany Park. While observations show Coffee Park had the highest use ratios, Germany Park’s use ratio was among the lowest of the parks in the city. Further analysis of other park elements may shed light on this relationship but the observation ratios in this study would tend to discount surfacing alone as contributing to higher use levels. 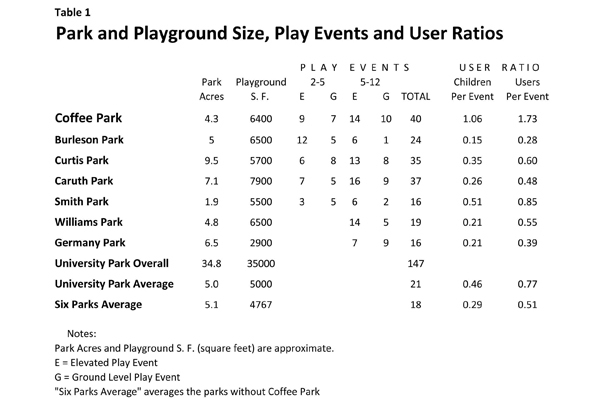 From observations, the playground facility at Coffee Park was found to have higher use ratios than other parks by over three times the citywide average. Of the individual parks, the two most comparable in size and facility amenities, Curtis Park and Caruth Park showed about one-third and one-quarter the Coffee Park user ratio respectively. The smallest park, Smith Park, showed higher user ratios but were still less than half that of Coffee Park. Use ratios at the remaining parks were less than one third of those at Coffee Park. The magnitude of the use ratios found at Coffee Park in relation with the other parks would suggest support for the hypothesis that highly accessible play environments have higher popularity among the general population. Though the hypothesis is supported by the data, there are inherent limitations to the pilot study. Demographics in terms of population data within a defined service area of each park were not analyzed. While environmental variables that could reasonably influence park use such as acreage, tree canopy cover, available parking, drinking fountains, numbers of picnic tables and park benches, etc., were thought to be relatively even across the parks, they should become part of an overall analysis of user preference in a full research project. User surveys would also be helpful to include expressed preferences as a part of the research. Future research on the subject is warranted to add a more disciplined approach and consideration to missing factors. In conclusion, user counts are supportive of the hypothesis that a playground built to higher standards of accessibility in terms of the standards of ADA and professional practice receive more use reflecting higher popularity than other playgrounds. Further research that includes a designed research process combining demographic and environmental variables with user attitude surveys would be valuable to strengthen the findings. Support for the prime hypothesis would also tend to give support to the thought that accessibility has positive benefits to the general population as a whole. The findings may also be applicable to support many inclusive policies and projects in the physical environment as they relate to accessibility. Active Living Research, 2010. Parks, Playgrounds and Active Living. Robert Woods Johnson Foundation and San Diego State University, San Diego, CA. Pellegrini, Anthony D.; Perlmutter, Jane C., 1988. The Diagnostic and Thereapeutic Roles of Children’s Rough-and-Tumble Play. CHC Winter 1988, Vol. 16, No. 3. Burke, Jenene, 2012. ‘Some kids climb up; some kids climb down’: culturally constructed play-worlds of children with impairments. Disability & Society. Vol. 27, No. 7, pp. 965-981. Jeanes, Ruth, Magee, Jonathan, 2012. ‘Can we play on the swings and roundabouts?’: creating inclusive spaces for disabled young people and their families. Leisure Studies. Vol. 31, No. 2, pp. 193-210. Prellwitz, Maria, Skar, Lisa, 2007. Usability of playgrounds for children with different abilities. Occupational Therapy International. Vol. 14, No. 3, pp. 144-155. Moore, Robin.C. ; Cosco, Nilda, G., 2007. What makes a park inclusive and universally designed? In: Thompson, W.C.; Travlou, P. (Eds), Open Space People Space. Taylor and Francis, London, pp. 85-110. U. S. Department of Justice (DOJ), 2010. 2010 ADA Standards for Accessible Design.